Our visual arts offering goes from strength to strength. As well as providing On-line Gallery space to local artists via this website, we organise a number of Exhibitions each year. Our flagship visual arts presence is our acclaimed Open Studios project which usually takes place annually in September. We're taking a break for 2019 and plan to relaunch for our 10th anniversary next year. However, we will be initiating a new summer exhibition on Saturday 3rd and Sunday 4th August. A call for submissions will be going out shortly. We also have an annual Winter Exhibition at Penshurst Place's Porcupine Pantry, which runs from mid-November to the end of December. We offer several regular workshops each month including Life Modelling and Portraiture, in addition to a range of one-off specialist events run by local practitioners. In the past members have participated in workshops on topics such as calligraphy, fabric dyeing, Japanese appliqué, the principles of abstract painting and many others. 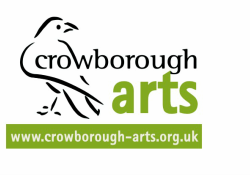 Crowborough Arts were invited to lead a local community project to enhance the main platform of Crowborough Station with vintage-style railway posters. The work of five of our members was selected and these have also been reproduced as sets of popular postcards. If you’re interested in purchasing one of these posters or a set of postcards please email or phone Mary Harris on 01892 653487. For current events please visit our events page.